Info: Details are still emerging. Tibetan self-immolator Sangay Tashi in an undated photo. DHARAMSHALA, November 28: In confirmed reports coming out of Tibet, a teenaged Tibetan set himself on fire in an apparent protest against China’s continued occupation of Tibet on Tuesday, November 27 in Sangchu region of eastern Tibet. 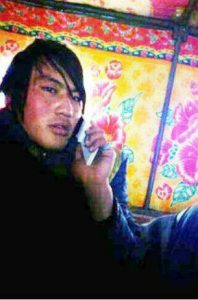 Sources have identified the young Tibetan man as Sangay Tashi from Sangkhog Ngyulre region of Sangchu in Labrang, eastern Tibet. According to other sources, Sangay Tashi shouted slogans calling for the return of His Holiness the Dalai Lama and the release of all Tibetan political prisoners, including the 11th Panchen Lama, while engulfed in flames. Local Tibetans then carried his charred body to a nearby house. Sangay Tashi arrived in Sangkhog town earlier that day with his friends. Before setting himself on fire, he reportedly called one of his relatives and told him that he had decided to set himself on fire for the cause of Tibet. Before his relative could carry on the conversation, Sangay Tashi hung up the phone and switched it off. By the time Sangay Tashi’s family members arrived in Sangkhog, he had already carried out his self-immolation protest. Sangay Tashi is survived by his parents and four siblings. He had studied at a primary school in Sangkhog town for four years but was forced to return home to help in family chores. Sangay Tashi carried out his fiery protest at the main street of Sangkog town, the same place where Thubwang Kyab, 23, passed away in his self-immolation protest on October 26. Six self-immolations in the last three days have pushed the number of Tibetan self-immolators to 87 inside Tibet, since the wave of fiery protests began in 2009. The recent alarming escalation in the protests has now witnessed 25 Tibetans set themselves on fire in the month of November alone, demanding freedom and the return of His Holiness the Dalai Lama from exile. Speaking to a reporter in south India, the Dalai Lama last week said that the ongoing wave of self-immolations inside Tibet brings tears to his eyes.